Everyone knows Brexit will be bad, but few know what to do about it. Attending a recent London Brexit think tank, a quick show of hands showed that the majority of the participants (a) knew that Brexit would hit them hard, and they would need to take steps (b) had no idea what those steps were, or when they would be taken. Advising them from a talent perspective, I expressed my view that standing still is not an option, even given the uncertainty. 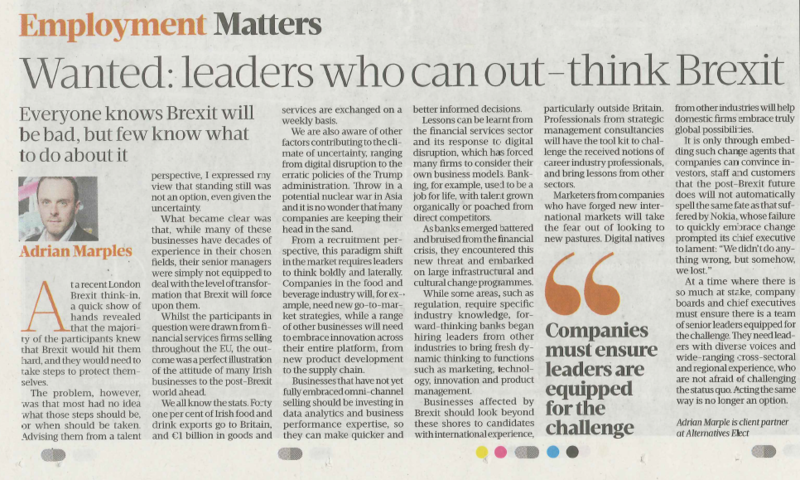 What became clear is that whilst many of these businesses have decades of experience in their chosen fields, senior management are simply not equipped to deal with the level of transformation that Brexit will force upon them. Whilst the participants in question were financial services firms passporting their products into the EU, the outcome was a perfect illustration of the attitude of many Irish businesses to the post-Brexit world ahead. We all know the stats: 41% of food & drink exports go to the UK, €1bn of goods & services being exchanged on a weekly basis etc. etc. We are also aware of the other factors which are contributing to the general climate of uncertainty, from digital disruption to the somewhat erratic policy goals of the Trump administration. Throw in a potential nuclear war in Asia, and it is no wonder that many companies are keeping their heads in the sand. From a talent perspective, this unique paradigm shift in the market requires leaders to think boldly and laterally. Companies in the food & beverage industry, for example, will need new go-to-market strategies, whilst a range of other businesses will need to embrace innovation across their entire platform, from new product development to supply chain. Firms who have not yet fully embraced omni-channel selling should be investing in data analytics and business performance expertise so their leaders can make quicker, and better informed decisions. Lessons can be learnt from the financial services sector and its response to digital disruption which has forced many firms to consider their own business models. Banking, for example, used to be a job for life, with talent grown organically or poached from direct competitors. As banks emerged, battered and bruised from the financial crisis, they encountered this new threat and embarked on large programmes of both infrastructural and cultural change. Whilst some areas, such as regulation, require specific industry knowledge, forward thinking banks began hiring leaders from other industries to bring fresh dynamic thinking to functions such as Marketing, Technology, Innovation & Product Management. Mark Coan (Chief Commercial Officer at Permanent TSB) and Tom Kinsella (Chief Marketing Officer at AIB) are examples in an Irish context. At a time where there is so much at stake, CEO’s & boards must ensure there is a team of senior leaders equipped for the challenge. Leaders with a diverse set of voices, and wide-ranging cross sector and regional experience, who are not afraid of challenging the status quo. Acting in the same way is no longer an option.